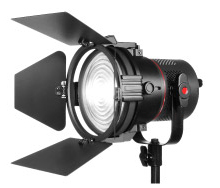 San Francisco, CA - April 4th , 2014 NAB Show - Fiilex, a leader in LED lighting for the broadcast, film and photo industries, announces the P2Q Converter Kit, a new accessory for the popular P360 and new P360EX lights. The P2Q Converter Kit attaches to the front of the light, and features a 5" fresnel lens that focuses the intensity of the beam by 8x. It greatly increases the throw while the attached barndoors help control any spread. The fresnel lens can be removed for standard operation and the Converter is compatible with future Q500 accessories. "The P2Q is really an example of our philosophy at work. We want all of our lights and our accessories to be as flexible as possible," says Brent Siebenaler Brand Manager for Fiilex, " We knew with the Q500 we would get more interest from the image-making world. It is a powerful, powerful light. We wanted to be sure that the P360 could work well along side it. That meant making sure it could take larger modifiers, and increasing the throw, because sometimes you have to get light into far away places. With the P2Q Converter, we have solved both of these issues, and gave the people more versatility in how they build light." The P2Q Converter Kit is available to order now from dealers throughout the U.S., Canada, and Europe. Product will ship in mid May The U.S. retail price is $350.00. For a complete list of dealers and accessories please go to www.fiilex.com.